I leave the house because I’m tired of screens. I want to work with a pen in my hand. That callous on the inside knuckle of my middle finger needs improving. I head for the library where I find some books waiting for me, one of which is Meg Wolitzer’s The Interestings. I am not allowed to read it. I’m supposed to be working. I decide I can’t be trusted so take the books out to my car. My car is parked down the street and in the back seat I notice a few things for the cleaner which is right there so I bundle them up and walk over. The cleaner isn’t open even though the sign says 9 a.m. and it’s 9:30. It occurs to me that I haven’t had breakfast so I walk to the deli, thoughts of a fresh Kaiser, unsalted butter and a splitch of shaved Black Forest Ham dancing in my head. The door is unlocked but just as I open it I see the sign says 10 a.m. And it’s only not even 9:35. The woman behind the counter looks up, sort of smiles… the lights aren’t even on yet… and when I ask if they’re open she very sweetly says well, not really. I can tell she’d sell me something if pressed but would prefer not to. I used to work in a deli, I know enough to smile and say I’ll come back. The cleaner is still not open at almost 9:40. The Giant Tiger, however, is selling some banged up but still quite lovely hanging baskets of geraniums and something else for $5. I drag three of them into the store [still carrying my bundle of un-cleaned cleaning]. The line to pay is unusually long but I’m just happy for a moment’s rest. I watch a woman admiring a sundress; she stretches it to see how wide it will go. Not wide enough apparently; she moves on. Another woman rifles through a rack of floor length, strapless, muumuu type things while her children run around in circles wielding pool noodles. It makes me sad to see that the girl wields a pink one and the boy, a blue. Part of me wants to speak to them, to introduce them to the joys of orange and yellow and green. But it’s none of my business really and, anyway, the line is slowly moving after the lone cashier hollers for help. As I try to manoeuvre my unclean clothes, a notebook and three hanging baskets, the mother leans over and offers a hand. It occurs to me that this is my chance… I can thank her, then casually toss in something merry but subliminally message-filled about the controlling ways of retailers who sell far too many pink and blue products and do we really want to be so corralled in our choices? But the kids are hooting and waving their noodles and I doubt she’d even hear me so I just smile and thank her most sincerely and pretty soon it’s my turn to pay and when I leave I thank her again and she looks so frazzled with those pink and blue children running around, and she there, clutching a floral print muumuu. I hope it brings her some peace. I clunk away with my three baskets, my bundle of clothes and my notebook [did I mention a water bottle?] and head back down the street to my car, cursing the dry cleaner the whole way. The deli is in the opposite direction. I have too much to carry to go back there. And I don’t feel like it anyway. So much for breakfast. Then I remember the café at the library. Except they have no gluten-free anything. The world is obviously against me. I almost leave but starvation dictates I stay. Turns out the banana bread is excellent. And the woman who is doing a bagel for so long I think she’s ignoring me, turns out to be awfully nice. Turns out she’s just doing a bagel. Probably a really good bagel too. Might have that next time. Screw gluten. Back at the library I write a while. Some good stuff. Some crap. Later, heading back to the car, I see that the cleaner’s door is propped open. I take my stuff in. I am not smiling. I am prepared to make a statement about signs in windows and punctuality in business and people having to trundle about the street and Giant Tiger with bundles of mens trousers. The woman speaks before I have a chance to say anything. In fact she even turns down the TV that is always on some station whose language I can’t understand. She has never turned the TV down before. She says oh what a terrible morning she’s had, something about the bus and how she still had to do laundry and cook and something about her husband and her kid and she tries but there’s all the sewing [she does tailoring too] and the floors to wash and how it’s hard coming to a country with nothing and a different culture and her kid is studying so hard and her husband works so hard and he wants her to have nice nails, he tells her to get a manicure, or fake nails, he wants her to have nice things, but look!, she says, and holds out her hands. She says she works too hard to have nice nails. They’re short and ragged and painted pink but most of it has worn off. I tell her my parents were immigrants too, that they came here with a suitcase, nothing else, not even language. She says yes, just a suitcase. I don’t ask where she comes from and she doesn’t ask about my parents. It doesn’t matter in the slightest. My dad used to want my mother to have nice nails. Something she could never quite manage. She just worked too damn hard to achieve that lofty goal. Haven’t thought of that in years. I’ve been looking for a new cleaner ever since mine retired. I’ve been to this place a few times, but the TV always annoyed me and the woman seemed grumpy and sullen; before today she hardly ever spoke. And she might go sullen again. Might leave the stupid TV blaring. I think I’ll bring a bottle of really good quality, long-wearing pink nail polish next time I take in my stuff. The very bloody least I can do is smile. This post struck me – perhaps it was the stream of consciousness aspect, or how things don’t always look like they seem… Regardless, thank you for sharing it. Thanks, Kristina. Always surprised [and delighted] when these odd bits of daily-ness strike a chord. This is good, Carin. Far more than “odd bits” or “daily-ness” (see above). The whole is the frame which is greater than the parts, which in themselves carry a poignant resonance. Especially the nails. 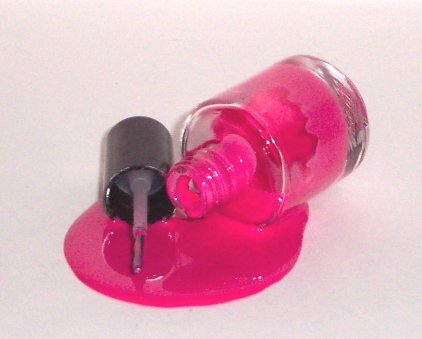 Did you truly upend a bottle of nail polish to take a picture? Ah. Because I was going to ask: why didn’t you use this instead of taupe?